Visit your local CA DMV office. Provide proof of your identity, Social Security Number, and residency. Pay the $36 driver's license fee. For more details on the California licensing requirements, please see below. California residents who cannot provide proof of legal presence in the U.S. are now able to get a CA driver's license. Please visit our CA AB-60 Law page for regulations and required documents for an AB-60 license. You must apply for a California driver license within 10 days of establishing residency in the state. Filing for homeowner property tax exemption. To apply for a new California driver's license, you must follow all the instructions in “Apply for Your CA License" below (including taking the written exam). Note, however, that the California DMV will most likely waive your driving exam if you already hold a license* UNLESS your license is from another country (see our section on non-citizens below). If you've never been licensed before, you will be given a permit once you pass your written permit test so you can practice driving before your driving test. If you've been licensed before, skip the learner's permit section. * Waived driving exams are at the discretion of the California DMV, so be prepared to take one if they ask you to. The Class C license allows you to drive regular, noncommercial passenger cars and trucks. The Noncommercial Class A license covers not-for-hire travel trailers weighing more than 10,000 lbs, fifth-wheel travel trailers weighing more than 15,000 lbs, and livestock trailers weighing more than 10,000 lbs but no more than 15,000 lbs. You can drive a house car (RV or motor home) up to 45 feet (no longer). Covers CA's GDL process, including Driver's Ed requirements, provisional permits, and provisional licenses. CA offers M1 and M2 licenses for motorcyclists. Find out how to get your Class A, B, and C commercial driver license (CDL), as well as how to add endorsements. The California DMV has begun issuing federally-compliant REAL ID driver’s licenses in place of standard driver’s licenses, which allow you to use your license for domestic travel and entry into federal and military buildings. You can choose to receive either a REAL ID or a standard driver's license—details are outlined below. Before heading to the DMV, find out whether you need to apply for a new license. You're a long-time CA resident who's never been licensed. Apply for a California driver's license. You plan to operate any of the Noncommercial Class A and B vehicles described above (“Types of CA Driver Licenses"). You have legal presence in the state and country. You do not need a new California driver license if you possess a diplomatic driver license issued by the U.S. Department of State. You're 18 years old or older and visiting CA with a valid out-of-state driver's license. You're an active military member or dependent stationed in California, as long as you have a valid out-of-state license and you haven't established CA residency. You operate farm vehicles off public highways. You can save up to 8 lives by saying YES to organ donation. It's the right thing to do. REGISTER TODAY and give the gift of life. “Apply for Your CA Driver's License" below will explain at what point during the application process you 'll receive your learner's permit.You must obtain a learner's permit before getting a full Class C or Noncommercial Class A or B license IF you've never held one of these licenses before. 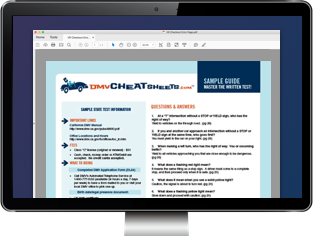 Don't leave your permit test to chance—take our free permit practice test with questions directly from the CA driver handbook. It's the fastest, easiest way to set yourself up for success! Make an appointment with your local DMV for the vision and written exams. NOTE: No tests are administered after 30 minutes before closing. Complete the Driver License or Identification Card Application. This form isn't available online. You can pick one up at the DMV or call the DMV's Automated Telephone Service at (800) 777-0133 to have one mailed to you. Marriage or verification of domestic partnership formation. Dissolution of marriage or domestic partnership. Rental or lease agreement signed by your landlord. The written exam consists of questions on traffic laws and signs. You have 3 chances to pass. NOTE: If you’re applying for a REAL ID, the CA DMV still requires 1 document proving each requirement (your identity, SSN, and California residency). Refer to the state’s list of acceptable documents for a REAL ID. * If you're a non-citizen who's legally present but doesn't have an SSN, or you're not eligible for an SSN, you're exempt from this requirement. Learn more at “Getting a California Driver's License as a Non-Citizen" below. At this point—and once you pass your written test— the California DMV will issue you a learner's permit (if applicable). Use this permit to practice for your driving test. You must practice with a licensed driver who holds the same class of license and is at least 18 years old. There is no minimum time you must hold the learner's permit. If you think you're ready, you can schedule a driving test as early as the next day. Make an appointment with the California DMV. Appointments are mandatory for this test. You have 3 chances to pass the driving test. There is no minimum waiting period between driving tests, but you must make an appointment for each one. The first test is included in your application fee; each test after that costs $7. Once you pass your driving exam, you'll receive a temporary driver's license that's good for 90 days. The DMV mails your permanent license; if you don't receive it within 60 days, contact the DMV at (800) 777-0133 to check the status. You'll apply for a Noncommercial Class A or B license the same way you would apply for a Class C license (see above), with just a few exceptions. You'll complete the Commercial Driver's License Application. Once you meet those requirements, the California DMV will issue your Noncommercial Class A or B permit. The same practicing restrictions apply, only your accompanying driver must have a full Noncommercial Class A or B license. Make an appointment with a CDL office. Bring either the Noncommercial Class A or Class B vehicle with you. Pass the pre-trip and safety inspections. Pass the skills and driving exams. After you pass, the DMV will give you an interim license until you receive your permanent driver's license in the mail. If you don't receive your permanent license in 60 days, contact the DMV at (800) 777-0133 to check the status. You are not authorized to work in the country or are otherwise ineligible. You can provide an acceptable birth date/legal presence (BD/LP) document. Your birth date/legal presence (BD/LP) document. This document shows your birth date and legal presence in the country. The DMV verifies this document with the United States Citizenship and Immigration Services (USCIS). * Learn more about applying for a SSN at the Social Security Administration's Social Security number website. More than 30 days from the day you apply for a driver's license, your application process will move forward normally. Fewer than 60 days from the day you apply for a driver's license, you can take all your tests but you won't receive a photo driver's license card until you present another BD/LP document that's valid for 60 days or more from the date of your application. Limited Term (LT) driver's license if your BD/LP expires fewer than 5 years from the date you applied for your license. Full driver's license if your BD/LP expires more than 5 years from the date you applied for your license. NOTE: Again, you do not need a new California driver's license if you possess a valid diplomatic driver license from the U.S. Department of State. You must submit this medical form when applying for a CDL OR other special vehicle classes (e.g. school buses or farm vehicles) in CA.